One of Robin Hood's greatest skills as a leader of men was his ability to put a good team together. He was well aware of the religious and spiritual needs of his men, and recognised that the addition of an outlaw who could read, with a basic understanding of medicines and Law, would be a great asset. But where to find such a man? The outlaws told him of a fat, cantankerous Friar, who had been dismissed from Fountaindale Abbey, Nottinghamshire, due to a lack of respect for his superiors. Although overly fond of his food and drink, the Friar had a reputation as a skilful swordsman. Robin found the Friar living by a stream, but before asking this stranger to join his band of outlaws there had first to be a test. 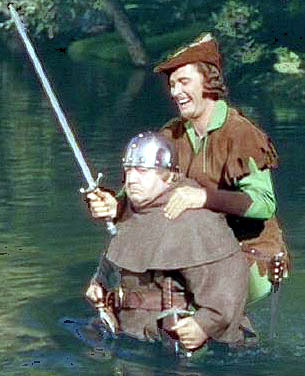 Robin goaded Friar Tuck into carrying him across the stream. 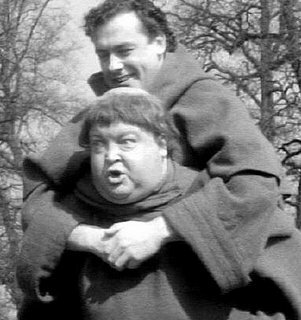 This he grudgingly did, but when they reached the other side, Robin insisted the Friar carry him back again. Half way across the water Friar Tuck's volatile anger reached breaking point and he dumped Robin in the water. This led to a swordfight (as Robin surely knew it would), and Friar Tuck's skill as a fighting man was proven. According to legend Friar Tuck actually beat Robin on that day. To see the actual site where Friar Tuck lived as a hermit before having to carry Robin hood across the stream see THIS LINK). Satisfied that Friar Tuck was just the man he was looking for he invited him to join his merry outlaw band. Tempted no doubt by a steady diet of the King's venison and stolen wines, Friar Tuck agreed. The Sheriff of Nottingham was never certain that Friar Tuck was a member of Robin Hood's Merry Men, and so he often served as a useful spy within the grounds of Nottingham Castle.